Yggdrasil is the World Tree of Norse Mythology, the Giant Ash tree that links and connects all the known worlds, the earth below, and the heaven above. Also known as the "Tree of Knowledge", the "Tree of the Universe", and the "Tree of Fate", Yggdrasil is the axis, the center of the creation of the Universe. Three roots connect the World Tree to the three wells that flow beneath. The well of Mimir whose waters are the source of all wisdom, the Well of Fate - Urdarbrunnr, guarded by the Norns, the well of Hvergelmir - Roaring Kettlle, the source of many rivers that nourish life. 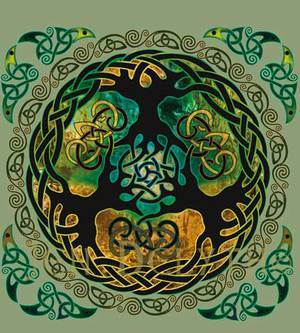 The World Tree is a symbol common to many societies. Within Celtic tradition, the Great Oak tree is most revered, and the Druids are said to have worshipped amongst the ancient groves. The great forests of our world help create the oxygen we breath. They are vital to our planet's diverse ecosystem.